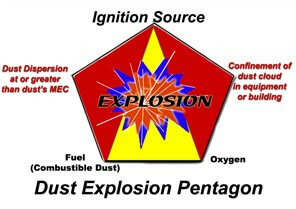 Combustible dusts are fine particles that present an explosion hazard when suspended in air in certain conditions. A dust explosion can be catastrophic and cause employee deaths, injuries, and destruction of entire buildings. 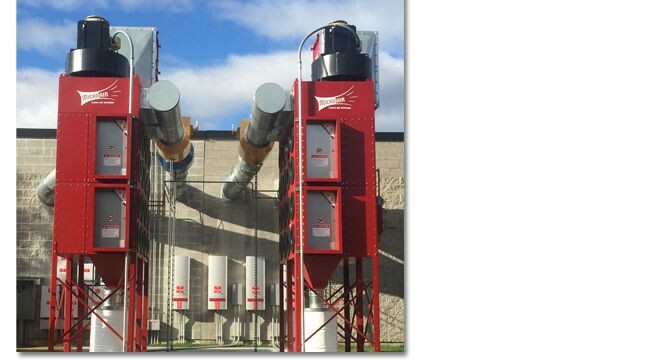 Micro Air® offers a complete NFPA/OSHA compliance package as an option on all of our dust collectors. Micro Air's network of Engineered Systems Distributors offer the expertise needed in systems design and can assess your operation and guide you through the complicated combustible dust issue to provide the most cost effective and compliant solution. Micro Air® offers the full array of combustible dust components...for both our RP series of cartridge collectors and / or our HYDROMAX® line of wet collectors. Do Not Risk the Devastation of a Dust Explosion at your facility! 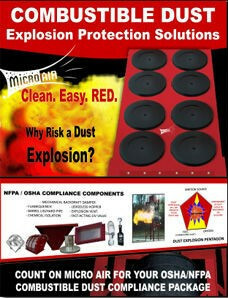 Micro Air® provides OSHA / NFPA compliant solutions for combustible dust applications. Understand OSHA's NEP on Combustible Dust?